Stats. They are everywhere. They are in your sports, your weather forecast, and now they are being used by Grammarly, too. Unlike that statistics class you took that one time, Grammarly Insights are designed to provide you with useful information about how you write. Some of you may have noticed that we started sending you a weekly progress report via email each Monday. 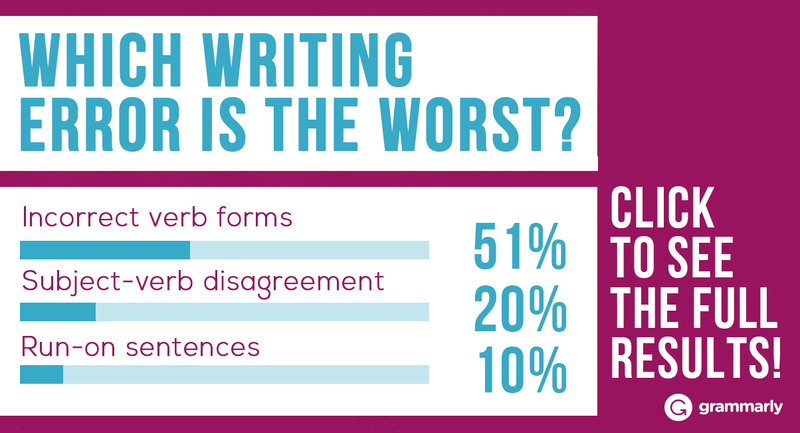 Many Grammarly users spend more time writing online than they may realize. Think about it. Between emails, blog posts, and status updates, our users are writing the equivalent of a novel each month, on average. That’s a lot of words! But what does that mean for you? Well, read on to find out. This progress report is an analysis of your writing with Grammarly and provides insights that may help you to become an even better writer. Your progress report looks at three main components of your writing: activity, mastery, and vocabulary. Activity measures your total word count for the week and also shows how often you used Grammarly compared to all Grammarly users. Our most active users are those who are utilizing our free browser extension in addition to our web-based Editor (or Grammarly for Microsoft(R) Office). Hey, all those status updates and emails really start to add up! 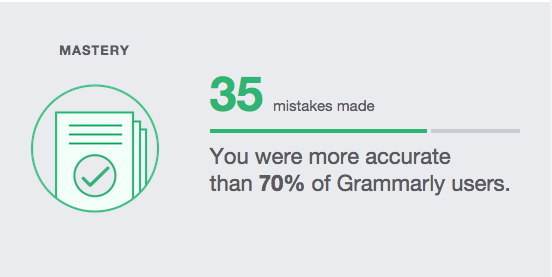 Mastery analyzes how many (or how few) mistakes you corrected with Grammarly as it relates to total words written. 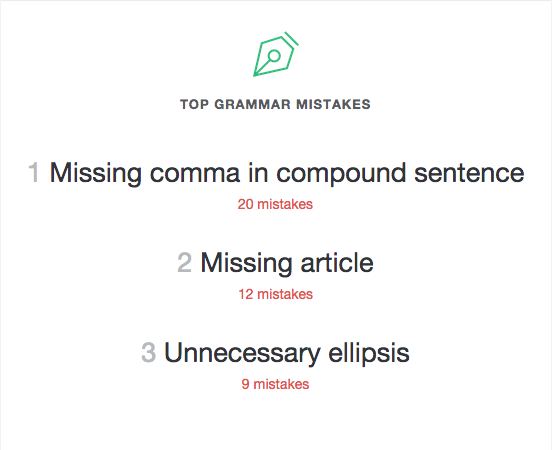 The fewer mistakes you need to correct with Grammarly, the more accurately you write. 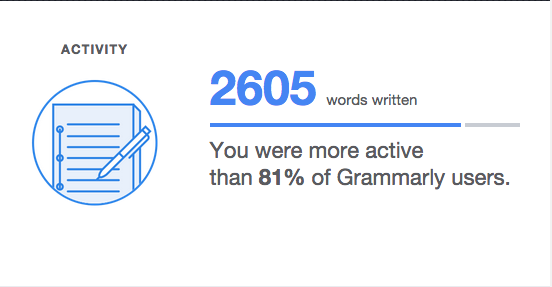 You can also see how well you did compared to all Grammarly users. Vocabulary examines your lexicon and word usage. This section will show you how many unique words you’ve written throughout the prior week. 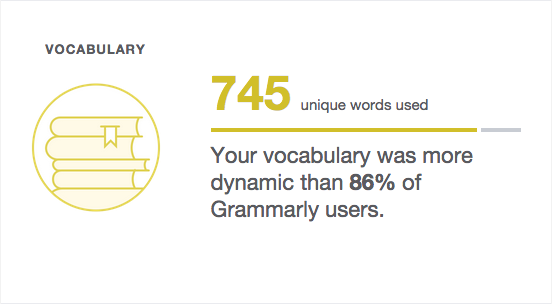 The percentage shown lets you know how dynamic—meaning, how varied and diverse—your vocabulary is relative to Grammarly users. Everyone makes mistakes. This section is designed to prevent you from making the same mistakes twice— or 17 times. This is where you’ll find the exact term for your three most frequent grammatical errors corrected with Grammarly. From time to time you’ll notice this section of your report. Your Spelling Adversaries points out the word you most frequently corrected with Grammarly within the previous week. 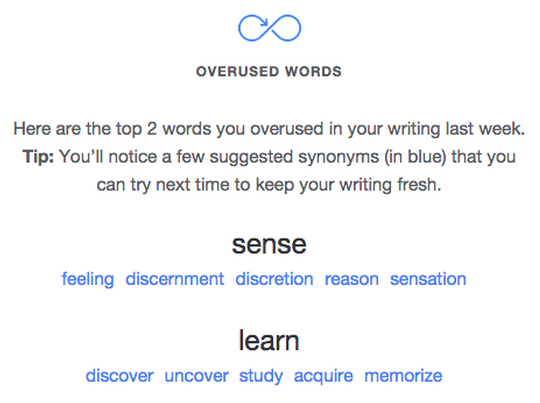 This section highlights the words you tend to use the most in your writing. Beneath each overused word, we suggest five synonyms you can use to enhance your vocabulary and perfect your writing. 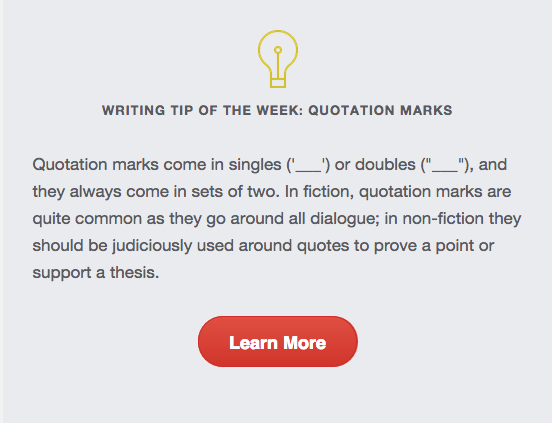 Lastly, Grammarly Insights starts each week with a helpful writing tip. We include these tips each week to help guide your writing. 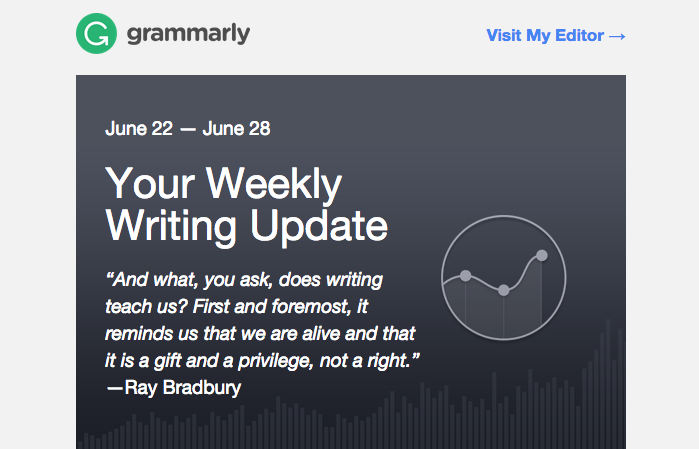 Have you received your Grammarly Insights digest yet? If not, sign up for Grammarly today and see a difference in your writing. We are constantly refining Grammarly Insights and looking for more ways to keep our writers engaged. We hope this new weekly email will be insightful for you! If you have any questions about Grammarly Insights or if you have suggestions for making it better, feel free to reach out to us via email: support@grammarly.com.